We are cat fanatics, breeders, and dedicated pet lovers. We feed a primarily raw diet whenever possible, and for years have struggled to find good commercial food for our pets to have alternatives. Bottom line, what we believed to be needed just wasn't on the market. 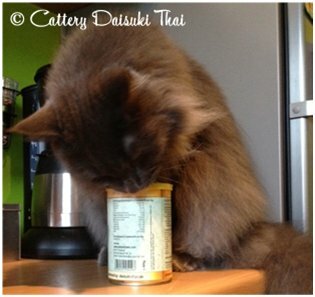 We could not understand what grains (wheat, corn, rice, you name it), berries and herbs had to do with catfood. One day we had enough and decided we can do better for our babies. Who are we? 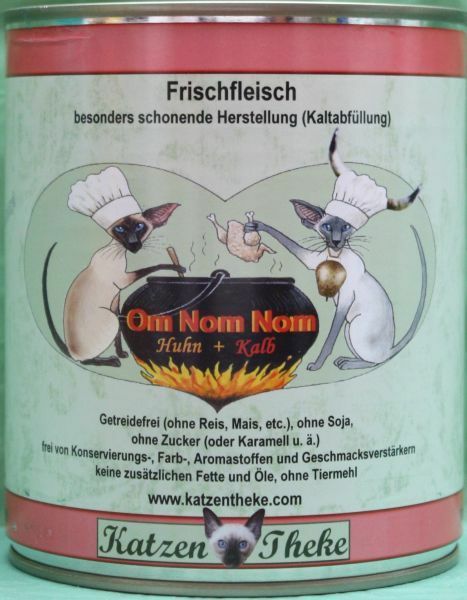 The idea was not to sell another brand of food, but to have what WE want, for OUR cats: Tons of fresh, human quality meat, pile of heart, heap of organ meat, chicken necks for calcium, a carrot for fiber, and nothing else! And all of that please produced in a gentle way so Taurine is actually not destroyed. 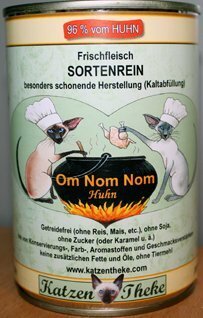 No preservatives, no sugar, no NOTHING but meat and ingredients a cat actually needs, wants, and can digest. A bottle of strawberry wine and a night of dreams and heated discussion later the rest is history. 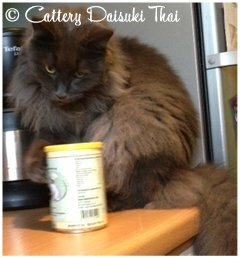 Please keep in mind if you previously fed lesser quality pet food, (anything with less meat) it is possible that your cat might react with loose stool. This is not a reflection on the food, but on the digestive system which simply needs a few days to adjust to a high protein diet. Label: Full disclosure, if it's in the can it's on the label and vice versa. • Cassia Gum* is a part of almost any commercial cat food, but was not mandatory to declare (we use 0.001 %) but we do it anyway. If you don't use it meat is rock hard 'balled together"
Production: Om Nom Nom is a carefully crafted natural product, the content from batch to batch can look slightly different. Taurine decomposes above 300 ° C, 'cold filling' is then steamed at much less and the taurine is preserved! but they can't be mixed better or they would simply fall apart.